THE LATEST addition to Oxford Gene Technology’s microarray range promises accurate and economical detection of copy number changes and loss of heterozygosity, all on a single array. 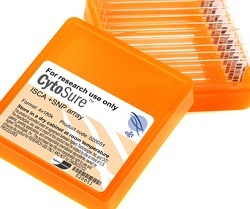 The CytoSure ISCA +SNP combines array comparative genomic hybridisation (aCGH) probes with fully validated single nucleotide polymorphism (SNP) content. The inclusion of SNP coverage for high-resolution detection of loss of heterozygosity (LOH) means that analysis of genetically-complex samples from related individuals is more thorough and more accurate, says the company. The aCGH probes incorporated onto the microarray are endorsed by the International Standards for Cytogenomic Arrays (ISCA) Consortium. OGT describes aCGH as the ‘gold standard’ for copy number variation (CNV) detection, but says that it has previously proved impossible to combine this with LOH and uniparental disomy (UPD) detection using SNP probes. As a result, laboratories has to use two separate arrays or resort to SNP-based CNV detection – a techniques it describes as inferior. OGT does not reveal the mechanics of its answer to this problem, other than to say that CytoSure ISCA +SNP uses ‘optimised probes’. The arrays incorporate content to focus on disease and syndrome-associated regions, in addition to offering whole genome ‘backbone’ coverage. As part of the package, OGT provides all CytoSure users with CytoSure Interpret software which it says makes data interpretation fast, easy, and consistent and minimises user intervention.